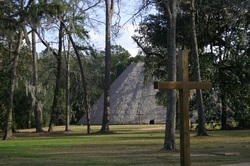 San Luis de Talimali was the western military, administrative, and religious capital of Spanish Florida from 1656-1704. It was the lineal descendant of the village of Anhaica where Hernando de Soto located his winter camp of 1539-40 in the vicinity of the present day capital complex. San Luis was moved to its present location by the Spaniards in 1656. Located on one of Tallahassee’s highest hilltops for defensive purposes, a series of blockhouses was built over the 48-year occupation of the community. It was home to a deputy governor, garrison, and civilians—the only sizeable European population beyond St. Augustine. There were also more than 1500 Apalachee Indians who lived under the jurisdiction of San Luis. With the establishment of Charleston in 1670, the threat of English attacks on Spanish Florida intensified. That threat prompted the planning and construction of a formal military complex at San Luis during the 1690s. This consisted of a two-story blockhouse and defensive outerworks including a stockade backed with a firing platform and bastions surrounded by a dry moat. Although soldiers stationed at San Luis had homes nearby, they maintained a round-the-clock presence at the fort. From the time the stockade was built in 1703, it provided protection for the garrison and all of the village’s residents when the alarm sounded, an event which probably occurred with increasing frequency toward the end of the site’s occupation in 1704. Written descriptions of Fort San Luis vary considerably with respect to its size, configuration, and building materials. The only known drawing of the fort was made during a reconnaissance led by Admiral Antonio de Landeche in 1705, the year after San Luis was burned and abandoned by the Spaniards and their Apalachee allies. Archaeology has revealed important information about military activities at San Luis, including the construction of early blockhouses and, eventually, a proper fort. Weaponry from the site reveals that military supplies were often outdated, and that bows and arrows were never effectively replaced. Other artifacts recovered from the military complex are related to its building and maintenance, routine duty, and the eventual sequestering of the entire village. In 1983, the State of Florida purchased fifty acres of the former mission capital including the military complex. San Luis is open to the public Tuesday-Sunday, 10 A.M. to 4 P.M. Closed Mondays, Thanksgiving Day and Christmas Day.